The battle of Jutland was the largest, most written-about and most controversial naval engagement of all time. The battle’s outcome was central to the history of the First World War. It was the turning point in Germany’s maritime strategy and heralded the launch of the unrestricted submarine war that brought America into the war on April 6th, 1917. It’s important that the history and lessons of Jutland are passed onto new generations whose language is digital and whose values have evolved. This is the metric of success. The Initiative seeks to communicate the wider story using animation, interactive museum displays, podcasts and crowd sourced participation for on-going research. The initiative’s ultimate goal is to provide a digital curation of the important Jutland memories and learnings and to help create a revived interest in our common history and a passion for learning. Listen to Nick Jellicoe, author of Jutland.The Unfinished Battle, talking with a friend, Caroline Buchler, about the book. He speaks about what motivated him, how he’s trying to innovate and what he hopes will be achieved with the Jutland Centenary Initiative. Short and long term. Podcast One : Why Jutland was decisive. Watch a 24 minute narration by Nick Jellicoe of the Battle of the Jutland with the aid of animated maps, graphics and contemporary photos. Nick explains the battle itself and the 1917 submarine war that resulted when the German Fleet commander, Admiral Scheer, persuaded the Kaiser and the Cabinet that Germany could never win a traditional Fleet-to-Fleet encounter with the British. “Congratulations on the animation. I enjoyed it very much and will show it to my kids and friends. There is so much to the battle, so many layers”. Awesome and thanks for sharing!! That was awesome, very much appreciated! Very good – frustratingly, it doesn’t have any credits on it about who made it. That makes it hard for anyone to think “Let’s Does anyone know the credits for this? Thank you for an outstanding piece, I am an amateur student of military history and my father served in the Royal Navy during the Second World War, so I had some idea of the battle but this has made everything so much clearer. My German wife (and her mother) knew almost nothing and this has been an eye opener for them. I look forward to reading your book. An outstanding production. The story told pragmatically, based on facts and with a cohesive and insightful narrative. This is how a military history video should be made. Thank you. Congratulations on a brilliant film. the most concise and comprehensible account of the battle that I have read. I have forwarded the link to colleagues in the Royal Naval Association, so you may expect a lot of visits as the anniversary draws near. Well you definitely succeeded in explaining the very complex ordeal that was the Battle of Jutland. If military history was presented in this form more often I think people would find it more interesting, a shame it has to be that way though. I’ll try my best to spread it around, that’s the least I could do for such a magnificent creation. Beautifully done documentary; best picture I ever had of that very complex battle. Robert K. Massie, Pulitzer prize-winning author of Castles of Steel and Dreadnought. Rear Admiral James Goldrick, RAN (ret’d), author of The King’s Ships were at Sea and Before Jutland. “Nicholas Jellicoe has not set out as an apologist for his grandfather. He has tackled head on the issues that the conduct of the battle raise – gunnery, ammunition, ship design, tactics, communication, intelligence. This is marvellously enthralling account of the battle that combines academic thoroughness with a unique element of personal observation. I found it totally absorbing and cannot recommend it highly enough”. The tactical and operational focus of Nicholas Jellicoe’s outstanding book is the right one. Jutland was a tactical and operational battle; neither side appears to have gone into battle with a clear understanding of how the outcome would fit into the war’s overall strategic aims. This is a book not to be missed by serious scholars and students of the Great War at sea – his evidence and argument ‘finish the battle’. This is a marvellously enthralling account of the battle that combines academic thoroughness with a unique element of personal observation. I found it totally absorbing and cannot recommend it highly enough. …This book, despite its author’s relationship to Jellicoe, does not eulogise the admiral but objectively lays out the whole Jutland story and offers a comprehensive and very readable narrative which the reader, newly coming to the Jutland battle and controversy, will find satisfaction that the author has addressed all aspects of the battle itself, its preludes, consequences and aftermath. … In summary Jutland: The Unfinished Battle is a worthy addition to the enormous Jutland literary compendium. The author’s familial links to Admiral Jellicoe, his graphic website supporting the book and his balanced, objective treatment of the subject make this book well worth reading. However, Jutland tyros should be warned that they may find themselves joining the ‘unfinished battle’ should they chance their arms by investigating the works described in the final chapter. 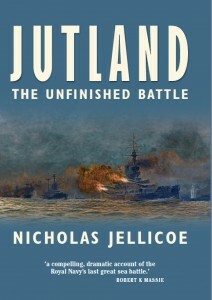 … Jutland: The Unfinished Battle is an excellent addition to the vast array of literature about the epic clash. May this ‘neophyte writer’, as he calls himself, carry on writing naval history. … This is an exceptionally well written and researched account which provides an insight into the relationship between high ranking officers of that era. All-in-all this is a good read and is very highly recommended. The best narrative account of the battle currently available. This book gives an excellent account of the battle, overall, and is recommended.